For obese individuals who have decided to undergo weight loss surgery, a new technique known as laparoscopic bariatric surgery is now available. This minimally invasive laparoscopic bariatric surgical procedure involves a bypass of a portion of the stomach. Options include laparoscopic isolated gastric bypass, adjustable gastric band, Roux-en-Y and sleeve gastrectomy. Using a small scalpel, four to six small openings approximately one-half to one inch long are made in the patient’s abdomen. These openings allow the bariatric surgeon to pass a light, a camera, and some surgical instruments into the abdomen. Next, the abdomen is inflated with carbon dioxide gas in order to allow the surgeon to get a better view of the inside of the stomach and its internal structures. Surgical instruments about the size of a pencil are then placed into the abdomen to perform the surgery. In a Roux-en-Y gastric bypass, more than 95 percent of the stomach is bypassed and only a small portion remains functional. A related bariatric procedure known as a sleeve gastrectomy involves the removal of roughly 70% of the stomach by bypassing the intestines. 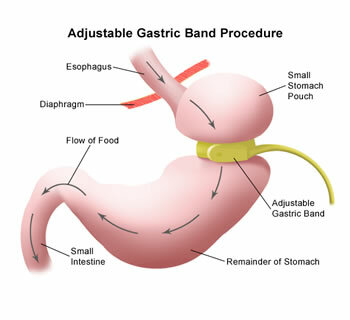 In an adjustable gastric band procedure, the stomach is restricted by the placement of the gastric band, which can be adjusted after surgery for further weight loss. A gastric band device is inserted through very small incisions in the abdomen and then placed around the upper part of the stomach. The resulting pouch (sometimes called the “new stomach”) dramatically reduces the digestive capacity of the stomach. The band has a balloon on the inside that is adjustable in order to reduce stoma size. This prolongs the period of fullness, and reduces food consumption. This weight loss surgery is performed under general anesthesia and takes from 30 minutes to an hour to complete. The band is fitted around the uppermost section of the stomach, forming a very small pouch. The pouch is designed so that it can be inflated or deflated at any time after the operation. With the support of a bariatric surgery diet, this helps the patient continue to lose weight until their weight-loss goals are achieved. 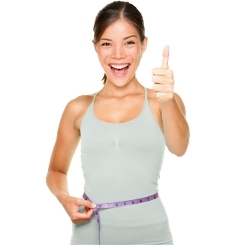 Minimally invasive bariatric surgery has been performed since the mid-1990’s. The overall results after laparoscopic weight loss surgery appear to be equal to open bariatric procedures. Given the fact that research shows that obese individuals have a shortened life span, many insurance companies now recognize obesity to be a significant health risk and are covering laparoscopic bariatric surgery. To be certain your insurance covers this type of weight loss surgery, contact them and ask about the following CPT codes: 43770 (adjustable gastric band); 43645 (Roux-en-Y gastric bypass); and 49320 and 43843 (sleeve gastrectomy). The most important benefit individuals experience is significant weight loss, the majority of which occurs during the first year following bariatric surgery. Medical problems such as diabetes, hypertension and coronary artery disease may also become easier to treat (or disappear entirely) after significant weight loss. Patients will also benefit from your surgeon’s use of a laparoscope which requires much smaller incisions than traditional weight loss surgery. There is normally less pain and scarring after surgery performed with a laparoscope, and recovery happens more quickly. Before deciding to proceed with what is a major health decision, it’s important to fully understand what is involved. Candidates for weight loss surgery must be carefully evaluated in order to assess the health of their cardiovascular, pulmonary and endocrine systems. A psychological evaluation is also considered essential by most physicians to determine the individual’s attitudes about weight loss and the potential for permanent lifestyle changes. Nutritional counseling is also a key part of the process. Minimally-invasive surgical procedures performed with a laparoscope are done with the goal of bypassing a large portion of the stomach. The most common procedures are laparoscopic isolated gastric bypass, sleeve gastrectomy, and adjustable gastric band. Using a small scalpel, four to six small incisions are made in the abdomen. These openings allow your surgeon to insert a laparoscope with a light, camera, and surgical instruments into your abdomen. The abdomen is then inflated with gas (carbon dioxide) to allow your surgeon to clearly view your stomach and internal organs. Using thin surgical instruments (about the size of a pencil), the surgery is performed in a relatively short amount of time. In Roux-en-Y gastric bypass, more than 95 percent of the stomach is “bypassed” and a much smaller portion remains functional. Sleeve gastrectomy involves the removal of two-thirds of your stomach with a “bypass” of intestines. In an adjustable gastric band (LAP BAND) procedure, your stomach is restricted by the placement of the lap band, which can be adjusted as needed post- operatively for additional weight loss. The good news is that most patients recover from bariatric surgery with no complications. The hospital stay is usually 1 to 3 days, with up to a month away from work required. Once you return home from the hospital, you will need to follow strict eating guidelines. A dietitian/nutritionist will be assigned to help you follow your bariatric surgery diet guidelines. Follow-up visits will be scheduled on a regular basis during the first year after your surgery to monitor your weight loss, metabolism, nutrition and overall health. Many weight loss surgery patients will need further cosmetic surgery in the form of an abdominoplasty one or two years after achieving their weight loss goal in order to remove excess skin around their abdomen. Fortunately, these days almost all bariatric operations can be performed using laparoscopic techniques. Currently, bariatric surgical procedures are the most effective way to achieve significant, sustained weight loss for the morbidly obese. Having said that, not all patients are suitable for laparoscopic weight reduction surgery, so an open bariatric weight loss procedure is at times necessary. For certain morbidly obese individuals, treatment of obesity through surgery is often more successful than fad diets, meal supplements and shape-up-in-a-hurry exercise programs. Acupuncture treatments may or may not be effective in treating obesity, but are certainly worth trying before finally opting to have surgery. It is generally agreed that when performed by properly trained surgeons, bariatric surgery with a laparoscope appears to speed recovery and helps patients return to a normal, productive life sooner than with open surgical procedures. Nevertheless, when considering weight loss surgery, be sure to research the background and qualifications of your bariatric doctor thoroughly. It is not a decision to be taken lightly. Ask the Doctor: Does Stomach Staple Surgery Work?